Even when I was a vegan, I was a huge fan of perusing omni food blogs for inspiration and I constantly found myself bookmarking recipes to veganize. Veganizing, my god I love it. I still do, even now as an omni, and one of my favorite bloggers to veganize is Lisa Fain, the blogger behind Homesick Texan (which, by the way, have you seen her latest post, Tex-Mex Fried Pies? I’m so so so veganizing those too). Lisa recently published her cookbook, The Homesick Texan Cookbook, which I’ve yet to invest in, but it’s high on my list, and when Serious Eats did a “Cook the Book” segment on it, I was pretty stoked. Nothing like getting a free recipe or two from a book. And one of the recipes SE published was hands down a winner for me–Cheese Enchiladas with Chili Con Carne. Never mind the fact that the two main components–cheese & chili–aren’t even remotely vegan, that wasn’t going to stop my ultimate Tex-Mex quest for happiness. And since I’d never played with Daiya before (I know, I know. But it wasn’t available in Roanoke until recently…that’s my excuse…), I figured it was the perfect opportunity to bust out a bag of pepper jack Daiya and have my way with. And, hot dog, am I glad I did. One of the things I love about Lisa’s cooking is that she easily introduces new techniques, and, for me, one of the fundamental techniques I learned a few years ago from her was how to deal with dried peppers. And that’s what really makes this dish shine–the glorious chili sauce peppered with ancho chilis, and, in my case, a chipotle one as well. And as far as the substitutes go, you can’t beat Daiya and TVP. Both mimic the real thing like a chameleon and, I swear to god, I really couldn’t stop eating these enchiladas, they were that darn good. Cheesey and rich and even meaty, this dish is a showstopper–and the best part is, it’s really not that hard to make. Or, well, maybe the best part is, leftovers all week if there’s only two of you! And while it might not be the most photogenic dish, it’s a rock star in flavor. So, thank you Serious Eats for posting the recipe, and, Lisa, I swear, I am going to buy your book–maybe after the next paycheck. In a dry skillet heated on high, toast the ancho chiles on each side for about 10 seconds or just until they start to puff. Fill the skillet with enough water to cover chiles. Leave the heat on until the water begins to boil and then turn off the heat and let the chiles soak until soft, about 30 minutes. Once hydrated, discard the soaking water and rinse the chiles. Place in a blender. Meanwhile, bring the 1 cup water to a boil. Place the TVP in a small mixing bowl and add the water, stir to combine. Let the TVP rehydrate. Set aside. In a large pot or Dutch oven, heat the vegetable oil, and cook the onions, occasionally stirring, until translucent, about 5 minutes. Add the garlic and cook for 30 more seconds. Place the cooked onions and garlic into the blender, along with the cumin, oregano, allspice, cinnamon, and 1 cup of water. Blend until smooth. In the same pot you used to cook the onions and garlic, on medium heat, add the TVP along with the chile puree and the vegetable broth, heat on high until boiling, and then turn the heat down to low and simmer for 30 minutes, stirring occasionally. After 30 minutes, adjust the seasonings, add salt, black pepper, and cayenne to taste. To make the enchiladas, warm up the tortillas. Lisa’s method: In a skillet, heat up the oil or lard on medium-low heat. One at a time, heat up the tortillas in the hot oil. Keep them warm in a cloth or tortilla warmer until all of the tortillas are heated. My method: Take half of the tortillas (6). Dampen two paper towels. Wrap the tortillas in the dampened paper towels and microwave for 20-30 seconds, until the tortillas are pliable and warm. Repeat as necessary. In a mixing bowl, combine the black beans with the corn kernels. Oil a 9×13 baking dish. Take a heated tortilla and lay on a plate or clean cooking surface, add even amounts of the Daiya and the bean-corn mixture. Roll the tortilla. Place the rolled enchilada in the oiled baking dish and repeat with the remaining tortillas. 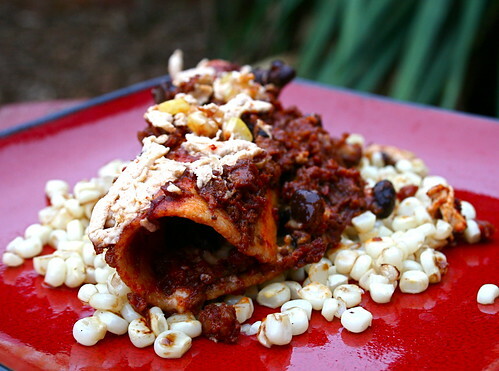 Pour the sauce over enchiladas and top with remaining Daiya and bean-corn mixture. Bake for 15 minutes, or until the Daiya begins to melt. Your enchiladas look so delicious! Have only recently started using ancho chillies and love their flavour. I’ll have to add this recipe to my long list of MoFo bookmarks! I love that you say it was hard to photograph…they are beautiful! I wish I could put it in the zine! Outstanding! That looks so, so good to me! I love veganising recipes too, it’s always a lot of fun. These enchiladas look amazing. Wish I had some here. I love and use Daiya mozzarella all the time, and sometime the cheddar, but I never know what to do with the pepperjack. But I just bought a bag of the pepperjack yesterday – HOW DID YOU KNOW? Can’t wait to try this! we never cooked with dried peppers until we tried a great pinto de gallo recipe from Lazy Smruf’s blog. since then, we cook with them all the time! your enchiladas look amazing, Jes – i cannot wait to make these for us to enjoy! they sound sooo goooood! Looks good! Glad you still have a heart for veganising. I haven’t really used dried peppers before but I would totally learn how to make the enchiladas. It looks so awesome! Beautiful photo too btw. reporting back – these were ridiculously awesome, Jes!!!! we tweaked the recipe just a smidge, but they rocked our socks off! dan would not shut up about them. hahahahahaa! thanks for another crazy delicious recipe, my friend!